The Tone Map sliders provide another mechanism to control exposure by adjusting the value range and color space of your render. Brightness: This is an illumination adjustment applied linearly to all pixels in your image to lighten or darken the render. Generally, we recommend you use the "physical" slider to get your illumination as close as possible to the desired result before touching the brightness slider. Gamma: In ProWalker GPU, the gamma slider works similarly to a contrast adjustment in Podium Image Editor. Lowering the Gamma value will appear to increase contract, darkening shadows and brightening highlights. Increasing the gamma slider beyond 2.2 has the opposite effect, compressing the value range and decreasing contrast. Lighting presets can be created and saved from the input box at the top of the lighting dialog. 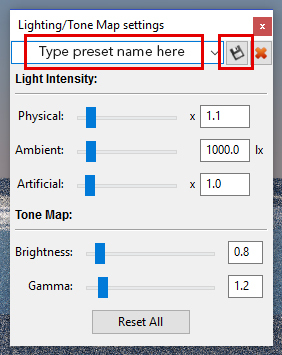 Once you've adjusted the values in the Intensity and Tone Map sliders to your liking, simply type a name into the preset line and click the Save (disk) icon to the right. Presets are accessible from the dropdown menu and carry over between SketchUp models. 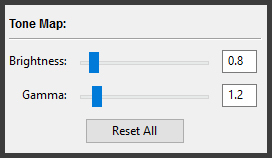 To delete a preset, select it from the preset drop-down, click the "X" icon, and then "OK".